It goes without saying that buildings insurance is one of the staple requirements of successfully managing a property. Covering everything from fire damage to break-ins and vandalism, buildings insurance will prove invaluable, should a disaster strike. Hamilton King, a property management company has developed this guide that takes an in depth look at one aspect of buildings insurance that every landlord should ensure is written into their policy – escape of water damage. What follows is a breakdown of escape of water damage policies, and the extent of the costs should your policy not cover escape of water. Hamilton King is a property management company based in Enfield, North London. The role of a property manager can cover a variety of tasks that landlords with large portfolios would otherwise struggle to find the time to complete. For instance, a property management company may perform all necessary health and safety inspections, as well as the necessary wear and tear maintenance that landlords can expect. Buildings insurance for landlords is usually a different kind of policy than that given to homeowners, because you have an extra factor to worry about – your tenants. Many products exist on the market to give landlords a full range of options, but it is important that you do not try to save money now by purchasing a cheaper policy, only to lose out later on when you try to make a claim. Also, if you are renting your own home out, you need to inform your insurer otherwise it will invalidate your current policy. Typically a good landlords’ buildings insurance policy will cover everything from public liability, to avoid nasty personal injury claims, right the way through to loss of rent and emergency repairs. If in the case of furnished properties, you might want to take out contents insurance for your furniture too, to be replaced on a like-for-like basis if needed. Finally, make sure that the insurance policy you choose covers escape of water damage, which is different to other types of damage caused by water. Reading the terms and conditions of every insurance policy you take out is going to be vital to ensuring you can make a claim. Water damage is separated by most insurers into three distinct causes, and not every policy will cover each kind of damage. A regular misconception occurs during particularly bad weather, if a heavy storm rips tiles off the roof of your property and then rainwater causes damage to the interior, this is separate to the same storm causing the river to burst its banks and flood the building. In the first example, insurers would class that as storm damage and in the second, that is specifically flood damage. Both of these are in turn different still, to escape of water damage, which is only caused by water from the property’s mains supply. Knowing the differences between each one is going to mean the difference between receiving a claim pay out and having to repair the damage yourself. 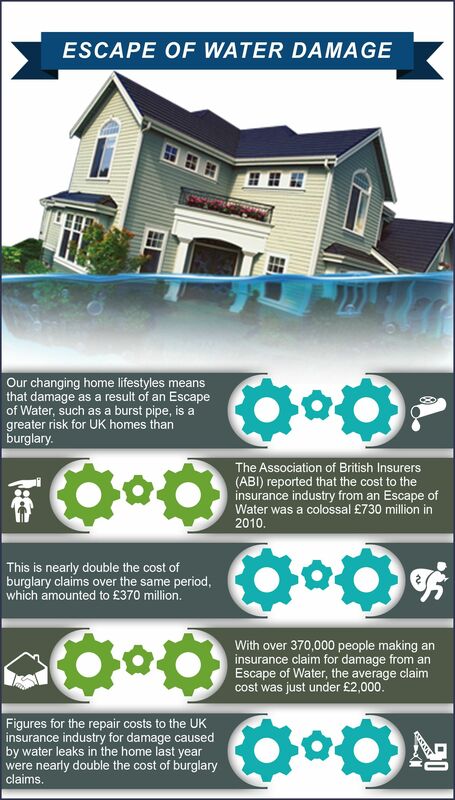 Escape of water damage has become the fifth most popular buildings insurance claim in the UK and the Association of British Insurers (ABI) reported that the industry pays out £2.5m per day in covering burst pipes. The reason that the pay outs are so large is because escape of water damage insurance covers three different costs for the policy holder. Firstly, the most immediate course of action is to call out a plumber and source the leak, which can take time. The next stage is to repair the damaged section of the pipe. Finally, you will have to assess the damage that the water has caused to the building. Even just finding the leak can cost a fortune especially if the plumber has to start taking apart walls and floors just to get to it. The importance of getting comprehensive escape of water damage cover cannot therefore be understated. Insurance providers go to great lengths to try and provide products that suit every customer, which is why some policies leave out the vital cover that you might need. Make sure that your policy covers every eventuality though, otherwise you could be faced with having to cover the costs yourself. Alternatively, use a property management company to take care of the paperwork for you.